MOBIZ: Yahoo going after iPod? 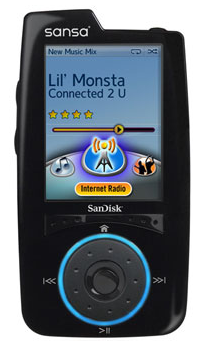 Yahoo just announced the release of the new SanDisk Sansa Connect WiFi media player, which comes preloaded with Yahoo Music. The device costs $250, comes with 4 GB of memory and a 2.2 inch screen. It supports Yahoo’s personalized radio, sharing playlist suggestions over Yahoo messenger, Flickr photos, and unlimited downloads on Yahoo Music for $12/month. Its getting crowded out there with Apple iPod and Zune to choose from. Wonder when Google coming with GoogPod?? ?